My Aunt Katy asked if I'd help her out creating a little somethin' somethin' to include in the annual Fairy Festival for Willa’s Workshop, Inc.: a non-profit corporation formed in 2008. Its purpose and mission statement is to foster the spirit of creativity and generosity in children. Through Willa’s Workshop, children meet throughout the summer months to create art, handicrafts, and other projects. All of the creations are saved for the annual Fairy Festival (this year on September 9th, 2011), where they are sold and the proceeds donated to charity. In addition to the sale of handicrafts, the Fairy Festival is a celebration of life and childhood. Children are encouraged to dress up and participate in the fairy-themed activities of the night. Each year, the proceeds of the Fairy Festival are donated to a different deserving foundation. Willa’s Workshop was formed to celebrate the brief, spectacular life of Willa Tempest Jones who was born September 9, 2007 and passed away on September 13th 2007 from a large brain tumor. 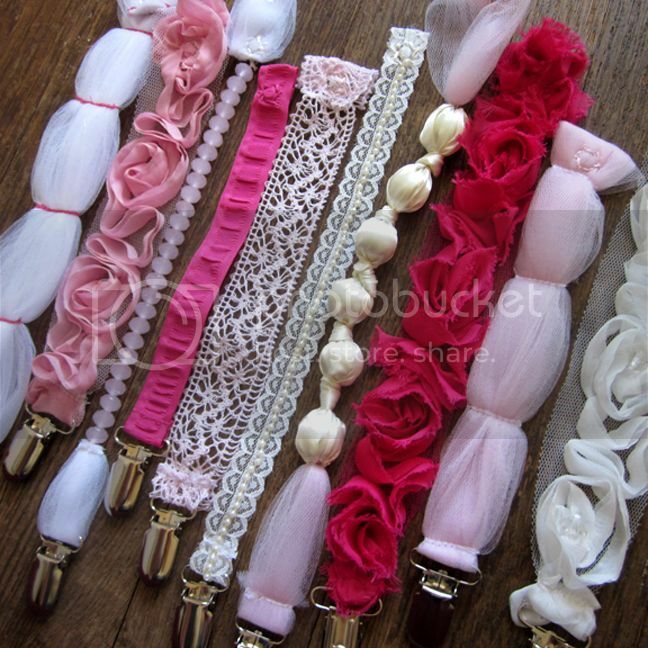 10 unique and beautiful girly pacifier clips. 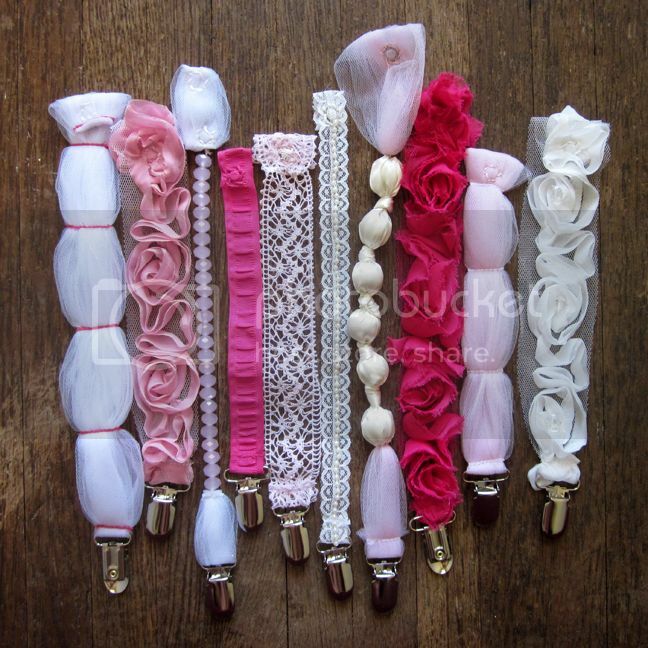 I used pink and white tulle, three different colors of rose ribbon, jewel beads, crocheted trim, pearl beaded lace, and more, to create each clip. Pacifier clips are great because they prevent paci's from falling on the ground and getting dirty when baby spits them out (and the dog running and grabbing it and chewing it to bits... yeah... live'n'learn...). Plus they're just a cute accessory! This year, the Fairy Festival will be on Friday September 9th at 6:00 PM so if you're in the Salt Lake City area be sure to check it out and help donate to a wonderful cause! Check out my etsy shop for a bigger variety! Those are beautiful, Paige, and to think they are functional, too! Our baby Lily used to take a pacifier but won't much these days. I'm afraid she'll end up a thumb-sucker like our Aimee who is still sucking her thumb and she's almost 4! It would have been so much easier to take away her pacifier than to figure out how to get her to stop sucking her thumb. These are absolutley gorgeous!! And to think we were ever satisfied with the boring ribbon ones! Paige, how CUTE are your paci holders!! My great niece would be so precious with one! you're so talented..I just love that! they are soooo cute! and what a great idea! dang! i will be in omaha! i also miss your BBWS by 1 day bc i arrive in cali on the 17th. just my luck! btw, i would LOVE to come visit you! let me know! so cute!!!!! i want a girl.. wahhhhhh. hey where did you get all this stuff? fancy the downtown fabric district ever? i want to do some projects and am thinking about going by sometime if you wanna join! These are just wonderful!! I love how pretty they. What a really cool idea! these are so cute..really meant for baby girls..
Love the ideas of having these..
and also I would like thank you for dropping at my blog with motivated comments. these are soooo cute!!!! and I may or may not need these by december, depending what we are having!!! thanks sooo much for the sweet comments on my blog about my card I LOVE your challenges even if I can't get to them every week!!!! have a good one!!! Paige, these are SO adorable!!! Leave it to you I guess ;) Love em! Stunners! What a wonderful cause. Wow, those are so cute! I need to make some girl, and boy versions soon! Thank you so much for your wonderful contribution! Your pacifier clips were a big hit on Friday night. We truly appreciate your generosity. Where did you find the actual clips?? SOOOO cute! I'd love to make some too for my sister-in-law's baby - any chance you could do a tutorial? I want to buy one of these!! Are you selling any?? Let me know.